1. General History: Exhibited in Canada, England, Germany and India, thanks to grants in the following communities: Center for Studies Baalgisian, Ontario New Democratic Party (London North Central), Canadian Education Opportunities, Islamic Center of Southwestern Ontario, Palestinian Cultural Center, London (ON), and People of Conscious. 2. Background: Organized by Mendel Art Gallery, Saskatoon, Saskatchewan. The exhibition features the works of artists Edward Poitras, Grant McConnell, Jamel Hassan and Kay WalkingStick. Guest: Joyce Whitebear Reed. Event: Exhibition The post-colonial landscape: a billboard exhibition, Saskatoon, Saskatchewan, May 31-September 20, 1993. 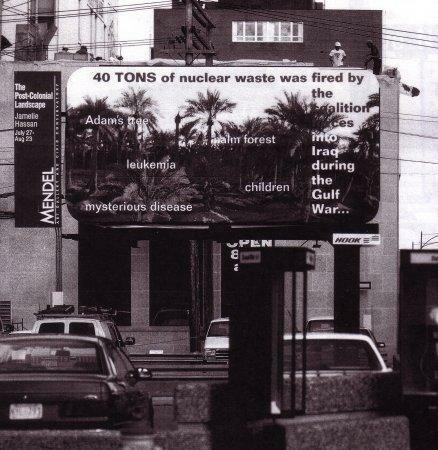 Exposure Hassan billboard: July-August 1993. 3. History: exhibition of the work coordinated by Sue Malvern, cultural critic, and the British Council. 4. History: exhibition of the work when American troops were poised to invade Iraq. The artwork envelope can be easily stowed in a box and transported.